This may be one of my absolute favourite outfits this year – I adore wearing co-ords sets with matching tops and bottoms – though I’m posting this nearly two months after actually wearing it (I shall explain)! I’ve been going a bit Mango-crazy lately: Basically I’m loving just about everything they have on their website this year. From their statement earrings to the striped shirt I wore last week, I’m having a Major Mango Moment right now. Firstly, the palm print is to die for. The colours (blue, brown, pink and black) are perfect for the transitional summer-to-autumn season. So the co-ords will work either as a set in the warmer months or as separates in cooler temperatures with boots and a roll neck… I’m actually quite excited at the prospect of adding layers to it this autumn. 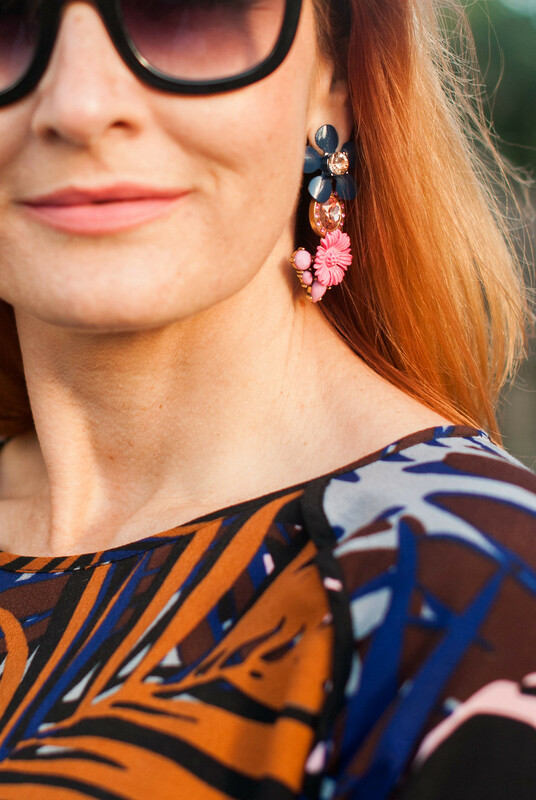 The other part of the outfit that I loved was the earrings – the second pair from my Mango statement earrings splurge. The colours couldn’t have been more perfect for the co-ords: Navy blue, pink and rose-gold (maybe the same designer designed both? Who knows). 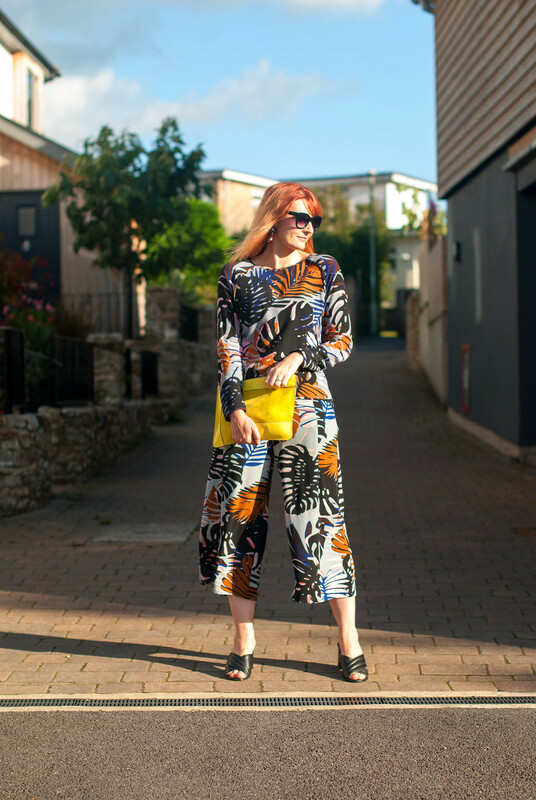 Anyway, together with the black crazy-comfy Madeleine mules and my bright yellow Jaeger clutch, it was one of those outfits that I felt I got absolutely spot-on and felt soooo good in. I wore it to two events: Firstly, to a panel talk I was invited to at Cambridge University (nowhere near as nerve-wracking as I thought it would be! ), and secondly, to the Nivea event where I learned all about their skincare range and which I featured in my brand collaboration intro posts on Instagram and Facebook last week (more to come on that soon). But both times I was on my own (without photographer, in other words) so outfit photos were never taken. I wore the outfit again this past weekend and we finally managed to coordinate a photo shoot at the same time… better late than never! One thing to note about the trousers: You can’t actually tell [I don’t think] at all from the photos, but when I received them they had a huge split all the way from the hem to mid thigh on both legs AT THE FRONT. It’s not a good look when you sit down unless you love showing off your legs like you would in a mini skirt – I’m not one of those people! But as Mango didn’t show the splits in the product photos or mention them in the details, I made the decision to join them together with iron-on hemming tape rather than sewing them up – it’s much neater and easier. So I’m going to be hard-pushed to come up with an outfit I love more at any time during the rest of this year. But when I eventually wear it with the layers and boots I mentioned I may just have to eat my own words. We shall see…! 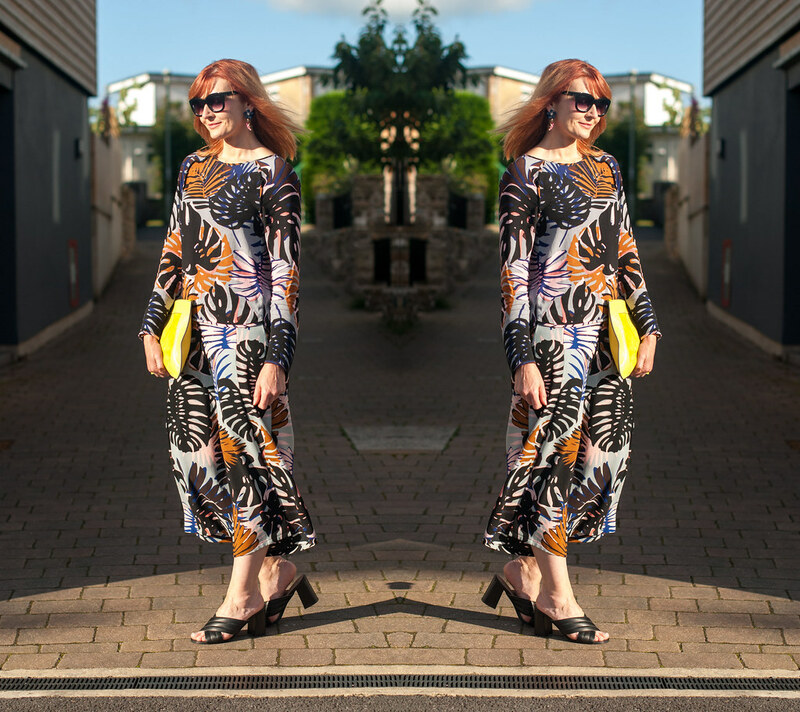 Time for the link up – do add your outfits to this week’s link up – and if you’ve added a link to here or my button to your post you may be featured next week! HAVE YOU DONE THE CO-ORDS (OR STATEMENT EAARINGS) THING YET? COMMENT BELOW, OR TAKE IT TO TWITTER @NOTLAMB! Love this ensemble and am a big fan of Mango! Love the cropped pants on you with the slides. So, so nice. What a great outfit. Love the print, the earrings and especially the bright bag. You know I am all for bright colours. I can perfectly understand why this a new favourite for you Catherine. 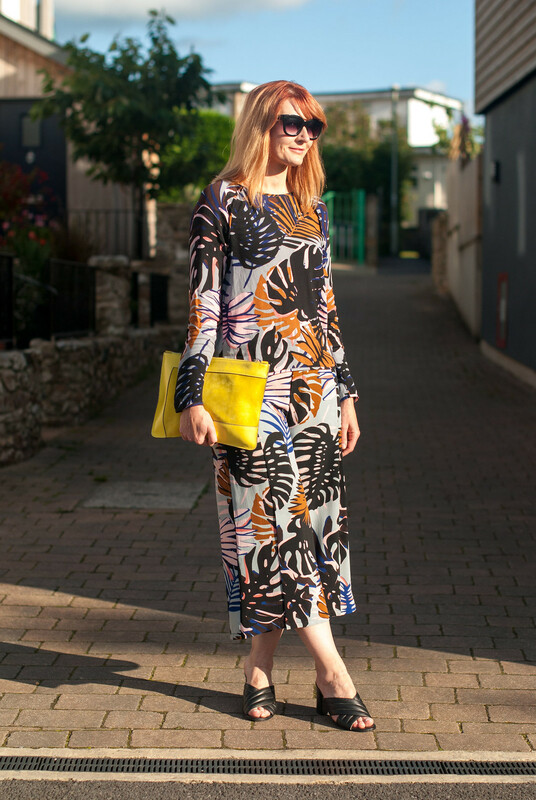 Palm print is lovely anyway, but this colourway suits you so well – the golden hue matches your hair so well. The versatility of the suit will be revealed in due course as you say with boots and sweater in the autumn I'm sure. Thanks so much for adding me to your line-up this week, so kind! I do like a bold tropical print. Hold onto summer!! 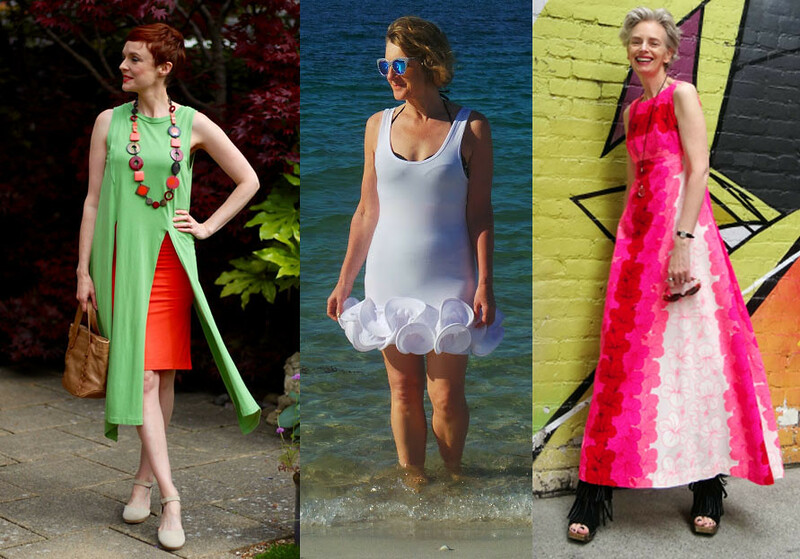 And yes, I've sewn up oddly placed slits a few times over the years. Such a stunning and stylish look! EEEK! I NEED THIS OUTFIT ASAP! Am a big fan of tropical prints and this outfit looks so chic and comfy. Love how you tweaked the pants with hem tape. I wouldn't want to be showing off that much leg either. That was a great idea to overcome that issue. And they look fabulous taped up! The pretty, eyecatching earrings go perfectly with that outfit. Oeh, I love that print and colours. I never have bought co ordinates but I think I just might have to! Wonderful look! I can definitely see why this would be one of your favorite outfits of the year! I love the print and how versatile these pieces are. Thanks for hosting and have a fantastic week ahead! Catherine I'm not surprised you've worn it a few times. It looks so well on you. The pattern is so in proportion to the cut and you. Yes, I do DIY on my items too. Oh I love the drapiness of these pieces and the pattern and colors are magnificent! And how clever to attach the open leg pieces. I would not have liked them split either. You are looking quite marvelous in this outfit and I adore the bright yellow bag with it! I'm glad you were able to make a couple of adjustments to make this outfit work Catherine, because it is fab! I love the pattern and shape. P.S… Thank you SO much for featuring my outfit in your lineup!! LOVE LOVE LOVE this outfit. I've got a thing for the leafy prints this season so it's just perfect in my eyes! I do agree about the splits though – I'd have done the same thing. Brilliant fix with the front slits – I wouldn't have thought of hemming tape. I'm glad you got it work-around because these colours and that pattern are so right on you. I can see why it's a favourite. I'm glad you got a closeup of the earrings too. Very nice. Thanks for the linkup – and thanks for including me with some friends on your Featured Favourites! What a smart way to "fix" those pants!! My mom (the 70+ model on my blog) is always doing smart things like that, to make a piece usuable and look great!! They definitely needing fixing, Jodie… there was no way I was wearing them as they were! !